Here it is; are you ready? Not all of us should wear Under Armour stuff. Period. Some of us are just packing a little too much extra "baggage" with us to pull off the look that entices us when it's on the mannequin. That's right; when it's on the ripped, V-shaped, steroid-using mannequin. When I put it on, I look more like I'm smuggling bags of something up from Cuba. If you're an ab-blaster-six-packed-super-pecked-out-punk who just "never seems to gain any weight no matter how many cheeseburgers you eat," well, congratulations. I'm not. And I just can't pull off the Under Armour Abernathy Men's Golf Polo. Sure, it breathes. Sure, it has great moisture transfer. Sure, it would keep me cool and dry on the course. It would also keep me the center of a conversation about certain clothing being a "privilege and not a right." Let's be fair, though. 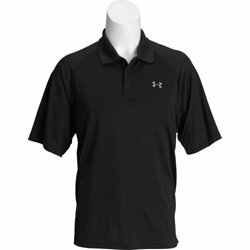 Usually UA stuff is very spendy, and this polo is fairly priced. It also appears looser than some of the other fitted stuff, but it still didn't work for a guy who can't eat all the cheeseburgers he wants. Better try before you buy.